We’d love your help. 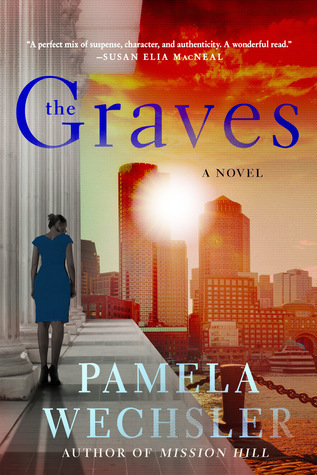 Let us know what’s wrong with this preview of The Graves by Pamela Wechsler. Abby Endicott, the chief of the District Attorney’s homicide unit in Boston, returns in the heart-racing follow-up to Mission Hill. Things are looking good for Abby: she’s top pick to be the next District Attorney, and her musician boyfriend Ty has moved in, despite her upper crust family’s objections. But a serial killer is on the loose, and with two college-aged girls de Abby Endicott, the chief of the District Attorney’s homicide unit in Boston, returns in the heart-racing follow-up to Mission Hill. Things are looking good for Abby: she’s top pick to be the next District Attorney, and her musician boyfriend Ty has moved in, despite her upper crust family’s objections. But a serial killer is on the loose, and with two college-aged girls dead and another missing, time is running out. When the sons of a prominent government official are linked to the murders, Abby pushes back, stopping at nothing to find justice for the girls. This time, the killer could be right under her nose, and she may be the next victim. To ask other readers questions about The Graves, please sign up. THE GRAVES is a fast moving murder mystery with action on every page. The protagonist is Abby Endicott who is a hands-on prosecutor for Boston District Attorney’s office. The author provides her readers with Abby’s backstory including details of her difficult family relations. Abby is passionate about her work creating her set of rules and guidelines that do not always mesh with family, friends, and her boyfriend Ty Wechsler introduces support character homicide detective Kevin Farnsworth, who w THE GRAVES is a fast moving murder mystery with action on every page. The protagonist is Abby Endicott who is a hands-on prosecutor for Boston District Attorney’s office. The author provides her readers with Abby’s backstory including details of her difficult family relations. Abby is passionate about her work creating her set of rules and guidelines that do not always mesh with family, friends, and her boyfriend Ty Wechsler introduces support character homicide detective Kevin Farnsworth, who works with Abby in the murder investigations. The storyline’s momentum increases at the turn of each page as the author introduces several subplots adding to the complexity of the developing mystery. Abby finds she is getting pressure from many individuals, including the district attorney and the Governor, to go against what she wants to accomplish. She thinks they are making unrealistic demands for her to change suggesting she give up her independence. Readers meet several support characters and learn their history the roles they play when Wechsler brings each character into the story. Review to come closer to pub day. I'm really torn between 3 & 4 stars and probably feel more 3.5 star rating honestly. I love me some Law and Order. So, The Graves def worked for me in that regard. This is a second book in the series and while I don't think you have to read the first to enjoy the second, I did feel there was a lot of mention about things that happened in first that would have been nice to know more backstory. This book is a lively mix of modern misery in the guise of ambitious prosecutors, DA, corrupt governor and mayor, pesky media, immoral college students where the wealthy/privileged class target the lesser-financially endowed females who naturally comply when given enough drugs and money to do whatever, whenever...allowing a serial killer to step in and take advantage of the many openings. The prosecuting attorney featured is compassionate toward the victims of crime but has zero life skills for This book is a lively mix of modern misery in the guise of ambitious prosecutors, DA, corrupt governor and mayor, pesky media, immoral college students where the wealthy/privileged class target the lesser-financially endowed females who naturally comply when given enough drugs and money to do whatever, whenever...allowing a serial killer to step in and take advantage of the many openings. The prosecuting attorney featured is compassionate toward the victims of crime but has zero life skills for taking care of herself since we have to understand she is a trust-fund baby who never learned how to cook or do laundry or pay bills whilst being a ferociously competent attorney? In addition to the elite schools featured, there is a boatload of designer name dropping for our "material girl" wannabe DA to cause nausea. And yet there were enough compelling action scenes and plot twists to keep me in it until book was finished. I won't need another dose from this series. This was the second book and I did not read the first. There's a murderer on the loose in this suspenseful mystery/thriller and Abby Endicott is determined to bring him to justice. Balancing career with romance and family drama is no easy feat, but if anyone can manage it the strong willed Abby can. The tension builds as Abby gets closer to unmasking the truth. This was a dramatic twisty page turner. I could not put this book down! This is an amazing legal thriller. I had read the first in the series so that I could be better acquainted with the characters and setting. While I don't believe that was critical to my enjoyment of the book, it gave me the background so that it put me into the action right from the start! Speaking of action, it did not stop. The whole book left me gasping for breath. The author never let up on the excitement! And, she left me wanting more. I look forward to her ne I could not put this book down! This is an amazing legal thriller. I had read the first in the series so that I could be better acquainted with the characters and setting. While I don't believe that was critical to my enjoyment of the book, it gave me the background so that it put me into the action right from the start! Speaking of action, it did not stop. The whole book left me gasping for breath. The author never let up on the excitement! And, she left me wanting more. I look forward to her next novel! First Sentence: Ten years in the district attorney’s office has taught me to never let down my guard, even here on Beacon Hill. A serial killer targeting college-aged girls is loose in Boston, and the son of a prominent government official. While Abby Endicott, chief of the DA’s homicide unit, is working with the police on the investigation, she also has personal pressure from her parents to leave her job, from her boss to run for his job, and from her personal relationship. But it is bringing a First Sentence: Ten years in the district attorney’s office has taught me to never let down my guard, even here on Beacon Hill. A serial killer targeting college-aged girls is loose in Boston, and the son of a prominent government official. While Abby Endicott, chief of the DA’s homicide unit, is working with the police on the investigation, she also has personal pressure from her parents to leave her job, from her boss to run for his job, and from her personal relationship. But it is bringing a killer to justice that is Abby’s first priority. It is not often one sees the legal process from the perspective of the prosecution. Learning now indictments are done is fascinating. We also get a look at the political and financial horse trading that goes on behind the scenes. It is also interesting watching Abby develop in her personal life. There is a very good balance of the professional and personal. However, considering the author’s background, one might wish more focus on the former than the latter. The legal and courtroom information really do provide focus and veracity to a story that has a compelling, and occasionally suspenseful, mystery element. “The Graves” is thoroughly engrossing and has an ending that is not pat, but is very satisfactory. It is a very good step forward in the series. Minotaur Books and NetGalley provided me with an electronic copy of The Graves. I was under no obligation to review this book and my opinion is freely given. Abby Endicott, chief of the district attorney's homicide unit in Boston, has been struggling on many levels to find her footing after the events of the previous few months. Being cut off from her extravagant lifestyle by her parents, who did not approve of the dangerous nature of her current chosen profession, Abby is trying her best to main Minotaur Books and NetGalley provided me with an electronic copy of The Graves. I was under no obligation to review this book and my opinion is freely given. Abby Endicott, chief of the district attorney's homicide unit in Boston, has been struggling on many levels to find her footing after the events of the previous few months. Being cut off from her extravagant lifestyle by her parents, who did not approve of the dangerous nature of her current chosen profession, Abby is trying her best to maintain status quo with her boyfriend Ty. When a murder investigation thrusts the world of privilege into a negative spotlight, will Abby be able to use her unique perspective to gain the upper hand? Or, will the investigation put Abby into harm's way? Will an unexpected opportunity be exactly what Abby needs? The Graves is a well constructed story that would be at home on television as a crime or legal thriller. All of the elements are there: fast paced plot, interesting characters, and a good story. Abby is the star of this book, but her interactions with both friends and colleagues help to give her character depth. This book is a follow-up to Mission Hill, but it is not strictly necessary to read the books in order. Readers will understand more about Abby Endicott if they are privy to her past, but she is still a pretty interesting character without prior knowledge. I would recommend this book to readers who like legal/police thrillers and I look forward to a new Abby Endicott novel in the future. I decided to give this series another chance, but I'm sorry I wasted my time. I still don't like Abby. She's always making promises she has no intention of keeping, she's deceitful in her personal relationships, she treats her too-good-to-be-true boyfriend very badly. The thing I found most amusing is that because she's so busy, she runs out of clean underwear, and because she's financially irresponsible and has maxed out her credit cards and cash and fallen deep into debt, she can't go to Saks b I decided to give this series another chance, but I'm sorry I wasted my time. I still don't like Abby. She's always making promises she has no intention of keeping, she's deceitful in her personal relationships, she treats her too-good-to-be-true boyfriend very badly. The thing I found most amusing is that because she's so busy, she runs out of clean underwear, and because she's financially irresponsible and has maxed out her credit cards and cash and fallen deep into debt, she can't go to Saks but has to go slumming at Macy's to buy new underwear. Then she goes home and washes it. So she can wash new underwear but not her used undies? Pamela Wechsler has written a great follow up to her first book in the Abby Endicott series where her main character tries to prosecute the bad guys of Boston while working with local police. Wechsler has created a complex character in Abby. She was a rich girl whose life seemed to have been handed to her with no strings attached only to give up what her family wanted for her so she could fight for justice. She seems like an intelligent, accomplished, independent woman but at the same time seems Pamela Wechsler has written a great follow up to her first book in the Abby Endicott series where her main character tries to prosecute the bad guys of Boston while working with local police. Wechsler has created a complex character in Abby. She was a rich girl whose life seemed to have been handed to her with no strings attached only to give up what her family wanted for her so she could fight for justice. She seems like an intelligent, accomplished, independent woman but at the same time seems to have trouble with a few basics most people take for granted since not everyone grew up with so much money they didn’t have to worry about balancing a checkbook. Her romantic life is the only other thing that seems as disastrous as her math skills. Along with the complex character development in Abby, the reader is also treated to some oft hilarious narration by her as well as adequately described scene settings. Wechsler’s nearly two decades working as a criminal prosecutor shines through her description of the legal system and its personnel which provide a sense of realism to the story and plot line making you eager and willing for Abby’s next case. Her well-written and aptly described plot line moves quickly helped along with the requisite twists. Wechsler has created a challenging and at the same time entertaining story. In this second novel in which she makes Abby Endicott at the center of the story, she shows us the satisfactions and the troubles of being a female prosecutor. The novel has lots of themes, including the unusual situation of the accused person becoming his own lawyer. The courtroom decision is nicely checked away in the final pages of the novel. It's a novel that follows the usual themes in courtroom dramas. At the same Wechsler has created a challenging and at the same time entertaining story. In this second novel in which she makes Abby Endicott at the center of the story, she shows us the satisfactions and the troubles of being a female prosecutor. The novel has lots of themes, including the unusual situation of the accused person becoming his own lawyer. The courtroom decision is nicely checked away in the final pages of the novel. Four stars in part because my husband read this book to me, which makes it easier to enjoy as I enjoy the voice of the narrator so much. We find it difficult to follow the time line in Pamela wechsler's books. We also found it to be a bit confusing regarding the outcome for a couple of the characters which seem to come out of nowhere. Maybe we missed reading about that earlier as we did take some breaks. However overall we like her books and hope to get to the third one soon. this might be my favorite of the three so far, but i'm always a sucker for a serial killer in fiction. of course, the fact abby couldn't figure it out earlier (like RIGHT AWAY) was pretty concerning and makes me seriously doubt her abilities. also, while i'm definitely rooting for some kevin-abby action, if you have to TELL us that the sexual tension is palpable in the car, odds are we aren't feeling it. 3.5 stars. good fun. no bubkes. Wechsler weaves a crime story with interesting characters, office politics, political ambition and just plain human nature. I read this book in just a few days. I now want to go and pick up her last book Mission Hill. I recommend this book to anyone who likes crime novels, this one is better than most. Very enjoyable. Fast read with appealing protagonist. You can tell the writer knows her law and legal procedure. This is Wechsler's second book, and she gives away too much about what happens in Mission Hills to make me want to read that earlier novel. Too bad because I would otherwise definitely pick up another book by Wechsler. I really like this series and this very strong female character. This one ends with Abby opening a new door so who knows what will happen in the next book. Wish it was available now. It helps to read these two books in order to understand the characters involved. A good read. Couldn't put it down, evidenced by reading it in the space of just 24 hours -- actually, more like 20. Tense, suspicious, concern -- all feelings invoked with reading this ARC. Well worth buying! Abby Endicott is the head of the Boston DAs homicide division. She is faced with tracking down a serial killer while being a candidate for District Attorney. The killer focuses on College girls who work as paid escorts. Great easy reading. Lots of suspense! I'm reading this series out of order but I really like the Abby Endicott character. Looking forward to more from this author in this series. Loved the role that the city of Boston played in this brisk thriller but the shopaholic Abigail Endicott was frivolous and tacky. A well constructed murder mystery with plenty of suspense and local color is marred somewhat by the main character's snobbery and name dropping. Loved it ... looking forward to the next in the series! I read this in a day. I love this series. It’s a great read, moves along at a nice clip and the characters are interesting and likable. Fast-paced, multi-faceted believable characters, unexpected plot twists. highly recommended for fans of East Coast thrillers. PAMELA WECHSLER spent over fifteen years working as a criminal prosecutor at the local, state and federal levels. She has served as an assistant district attorney and assistant attorney general in Boston, and she was a trial attorney for the Department of Justice in Washington, D.C.. She has investigated and prosecuted a wide variety of crimes, including: murder, witness intimidation, sexual assau PAMELA WECHSLER spent over fifteen years working as a criminal prosecutor at the local, state and federal levels. She has served as an assistant district attorney and assistant attorney general in Boston, and she was a trial attorney for the Department of Justice in Washington, D.C.. She has investigated and prosecuted a wide variety of crimes, including: murder, witness intimidation, sexual assault, drug trafficking, stock market manipulation, and political corruption.